We've been looking at arch bridges lately and so I thought we might discuss this attractive, basket-handle arch, which is located in Berkeley, California. 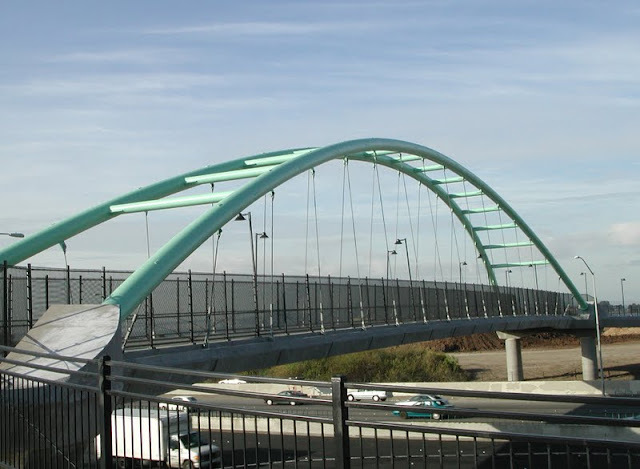 Designed by Mark Ketchum in 2002, this bridge carries pedestrians (and bicycles) over I-80 on a single, 95 meter span. This is a tied arch bridge, which is similar to a simply-supported girder. The arch is like the top flange of the girder, the deck is like the bottom flange, and the cables are like the web. The dead and live loads put the arch into compression and this force is resisted by the prestressed concrete superstructure. Arch Bridges: I-80 Pedestrian Overcrossing by Mark Yashinsky is licensed under a Creative Commons Attribution 3.0 United States License.